The humorous essays in the new book by Kara Martinez Bachman, “Kissing the Crisis,” take on middle age with a distinctly up-for-anything attitude. But balancing the desires to live life to the fullestwith the mundane realities of parenting and career is a challenge for anyone. I caught up with Bachman via e-mail to get her spin on parenting while writing a book, living life with humor, and keeping it all together (mostly). You approach much of your writing through the lens of humor. Was there a moment when you realized the power of humor? It’s always been my personality since childhood. I spend great effort trying to hold it back in serious or professional settings. There never was a “moment.” For me, it has always been easier to express things through humor than to deal with issues directly, I guess. At least in this book, it’s done consciously and with purpose — in real life, it sometimes gets old for my kids and husband to get a snarky or sarcastic response to every dang thing! I think I grate on people’s nerves in person, so it’s a blessing as a writer, but probably somewhat of a curse as a human being. In “Kissing the Crisis,” you tackle approaching middle age as a woman and as a mother. What about this period of life is particularly unique, challenging, or just plain absurd? What’s the one parenting take-away readers will get from “Kissing the Crisis”? That we worry about so many things that never come to pass. When my toddler son yelled the worst of curse words loudly in public or my daughter did something outrageous, I’d feel as if all the years spent at home with them were a waste. I’d think I had reared a prostitute and a criminal, or at least, two little weirdos. I’d beat myself up about every little thing when stuff went awry. But it’s funny because now that they’re older and shaping up to be wonderful people, I realize all that worry was pointless. What is your writing Kryptonite? Your writing superpower? Kryptonite would have to be the internet! I have to refuse to go online, refuse to answer calls, refuse to look at texts. My closest friend is always aggravated by how difficult it is to reach me, but it is what it is. In terms of superpower, mine is that I have an extremely high tolerance for embarrassment, which is necessary when writing first person essays. To do it effectively, you have to be honest and willing to show readers your worst. I’m that person who chooses the ridiculous pictures of herself to post as profile pics instead of the attractive ones. I’ve got no explanation for this behavior, I probably need to talk to a therapist about it! What’s the funniest story that didn’t make the final cut? There is one chapter I removed from the manuscript. It was about the weirdness I suffered–and still do–of preferring fake stuff like internet forums and “American Idol” to having a social life. Now that the show’s off the air, the essay felt a bit stale. I’mstill writing stories down, hopefully for a follow-up to this book. Truth is, we ALL have funny stories. We ALL witness zany stuff. The difference is that I’m obsessed with writing it all down. My life is really, really boring, but any life experience at all can be mined for the funny. Sometimes the best stories are found in very simple things, it need not always be over-the-top, and young kids are a great source of these little gems. Any tips for balancing parenting, work life, personal life, and writing a book (or tackling any creative project)? I’m not the person to ask. I’m a mess. There is no balance whatsoever, either in life or in mind, when you’re obsessed with writing or any other creative thing. The only tip I have is to marry somebody who loves you enough to put up with your weird night-owl hours and the incessant sound of keyboard typing! Kara Martinez Bachman is a New Orleans-based writer whose work has appeared in the New Orleans Times-Picayune, NOLA.com, The Writer, Funny Times, NPR’s State of the Re:Union, and many other publications. She is also managing editor for three editions of Parents & Kids. 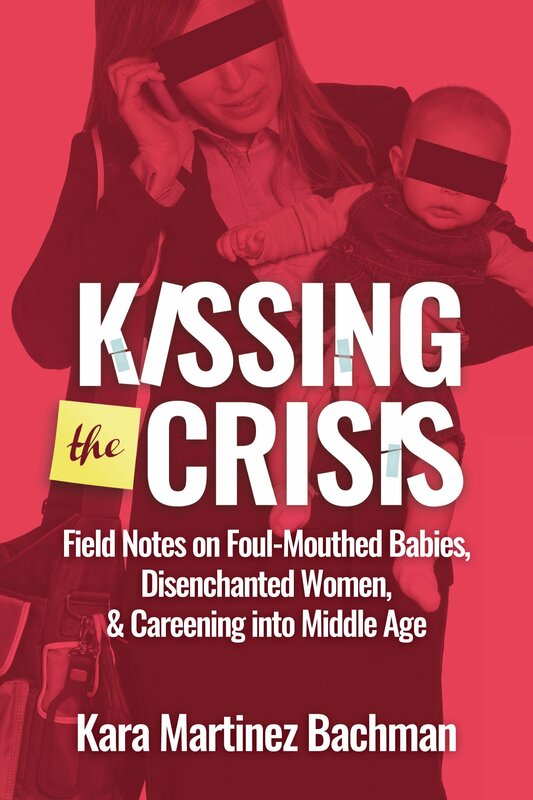 Her book, “Kissing the Crisis: Field Notes on Foul-Mouthed Babies, Disenchanted Women, and Careening into Middle Age,” is available from Quill Driver Books beginning February 1, 2017. Pre-orders are available now through quilldriverbooks.com or amazon.com. Heather Parish is a freelance writer and theater director based in California.